Photograph kindly loaned by Brenda and Michael Skinner. Names as remembered by John Pearce, Colin Charter, John Chapman, Jean Miller and Sheila Chapman. Back row (standing, left to right): Terry Dixon, Ken Starling, Reg Hagger, Brian Norton, Chris Charter. Third row (standing, left to right): (girl), Jane Robinson, Janet Skinner, (girl, possibly Ball? ), Brian Haines, Colin Charter, Margaret Pearce, Betty Reynolds, Sheila Chapman. 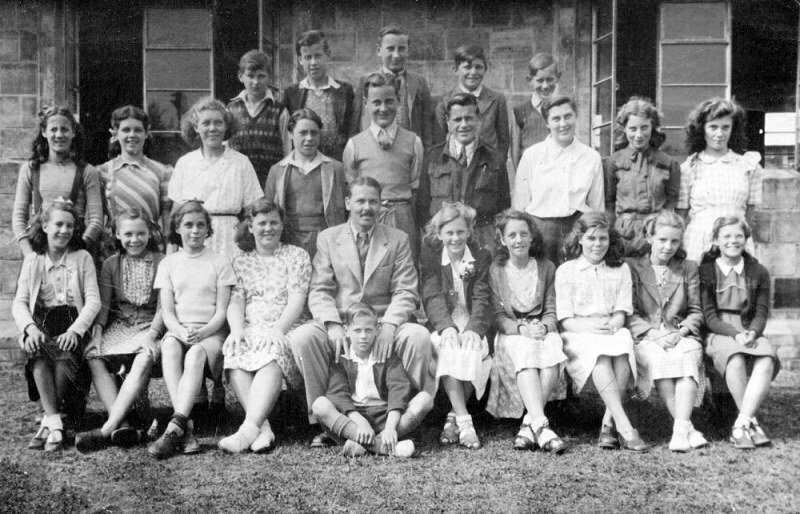 Second row (sitting on chairs, left to right): Emily Gill, Brenda Booth, Edna Robinson, (girl), Mr Sommers (Teacher), Jean Miller, Marjorie Bird, (girl), Ann Dance, Mary Cox. Front row (sitting on grass): Bobby Miller.